Your brand is represented every single point in your business. Have you ever thought of branding your own business? Well, I know many of you did brand your company by advertising, by designing a good logo, by designing templates and design to your website, create a tagline, and many more strategies. But, have you ever thought of using a toll-free number? If not, then let me tell you that a toll-free number helps a lot in building up the brand image of your company and with it, branding will find wings on its own. People who do not know about your business, know you through your website and if that website flashes a toll-free number where customers can make a call without getting tensed about the call rates, this makes them imagine that your business is branded offering facilities to its customers. After all, what we want is customer satisfaction and what can be better than that they call you without getting worried about their call rates and talk endlessly. As an entrepreneur, you did think of many instances and thought of using it to make your business grow higher and higher but what you thought of achieving and building your position in the market is not as easy as you have thought. A toll-free number is an important tool for business and make look like a business. People from various business sizes prefer having a toll-free number to gain its importance from startups to even well-established everyone prefers it. “Without a toll-free number, your business is not existing”. 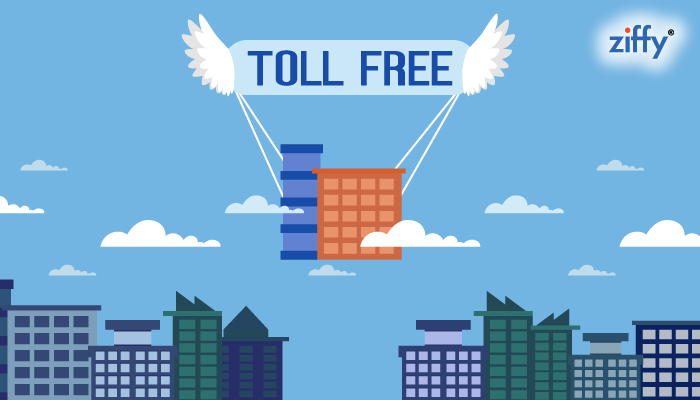 Make Your Business Fly Higher With Toll-Free Number! If you have been thinking that toll-free number is an expensive deal and will cost you heavy then let me tell you that it is absolutely no more a luxury thing that a business cannot afford for themselves. If you want to brand your business and make your product popular in the market, vanity number comes in handy. They help your business attractive as when your customer will know that you have a fancy toll-free number they feel easy in connecting you. A number that is easy to rememberable, dial, and recommended to others will create its importance on its own. For example, a company manufacturer of flowers used the toll-free number 1800-FLOWERS to offer services to its callers and customers. As they say the best things in life is free. The same goes for business when someone is offering his business with some free facilities they get attraction most than any other things. The approach of many businesses is to present their business best and built up their brand and the perfect way to make it happen is to make customers happy. A toll-free number is the best way to make them happy as when they call they do not have to suffer from the huge amount of call rates and they can easily talk without biting a hole in their pockets. The growing use of internet all over the world helps the business deliver services and products remotely to any part of the world. Now, to connect with your customer you do not require local contact number but with a toll-free number, you can easily call them from any part of the world. This gives the customer feel assured that he is being listened and heard more easily and this increases your brand value. Your business will gain importance and you will easily flourish in the market with a toll-free number. Previous Previous post: Convert Your Customer Words Into Valuable Services! Next Next post: There's More to Business Communication Than We See! Awesome post and help, Now I understand this vanity number and toll free number so that I can have one for myself.